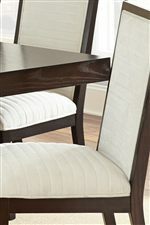 Create a dining space that highlights contemporary sophistication with this chic dining set. The table features a unique pedestal base and clean lines for a modern minimalist look. Upholstered chairs in a gray chenille fabric complete the set, providing comfort and continuing the contemporary feel with a stark contrast in color and sleek tapered lines.